The great American folk, ballad and beyond singer Joan Baez has been an active presence since she broke through at the 1959 Newport Folk Festival. Sometimes characterised as a protest singer she is far more widely ambitious than that, having more to do with using her medium for humanitarian and politically active ends. Anyone can protest but not everyone can sing about injustice and rally the people like Joan Baez. Famously linked with Bob Dylan in the 1960s she was also his most ardent champion. She recorded Dylan songs with gusto and has done so throughout her career but her versions are not covers as such, more like the conduit between his work and a wider audience: for example she sang his songs at Woodstock in 1969 and many of her most famous recordings are Dylan pieces. Her take on “Farewell, Angelina” is probably as well known as the Bard of Duluth’s, which is some going. But Dylan aside Baez has also been a generous interpreter of many other folks, from Willie Nelson and The Beatles, to The Rolling Stones, Allman Brothers and Steve Earle. While she is classically folk in origin Joan has wide artistic importance: she sometimes sings in fluent Spanish (and other languages) she has made albums with top session fusion players like Larry Carlton and The Crusaders and written several memoirs that stand as resumes of her life and the times she when folk begat rock and music became mainstream rather than counterculture. Her recordings in the early years were with the influential independent label vanguard yet she has also issued significant discs for A&M, Portrait, Gold Castle, Virgin and most recently Koch. Baez has appeared with The Grateful Dead, Mimi Farina, Judy Collins, Jackson Browne, Mary Chapin carpenter, Bruce Springsteen, her idol Odetta, Paul Simon and countless others. Just mentioning the names Joan or Joanie, inevitably brings her to mind, thus ensuring her iconic status is real rather than casually worn. Often decorated and the recipient of major a awards – for example the Amnesty International Outstanding Inspirational Service in the Global Fight for Human Rights, she has remained true to her ideals and idealism. Her rise from Gerde’s Folk City in Greenwich Village to major festivals like Woodstock and Glastonbury testify to her longevity. 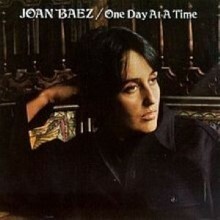 A true one-off is Joan Baez. The daughter of a Mexican-born Methodist minister who later converted his family to Quakerism, Joan Chandos Báez was born in Staten Island, New York in 1941 and she has always worn her East Coast origins as a badge of considerable pride. Her mother, also Joan, was born in Edinburgh, Scotland and lived to be 100. Her sister Mimi (later Mimi Farina was also a musician and activist who recorded with her husband Richard. While her family moved around the States due to Albert’s role in UNESCO young Joan pursued an interest in folk after seeing Pete Seeger. She bought her first Gibson guitar in 1957 and began performing the Boston music scene, contributing to the 1959 album Folksingers ‘Round Harvard Square. Her earliest inspiration was the songs of Odetta, Bob Gibson, Marian Anderson and Seeger. 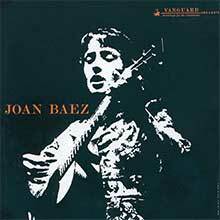 In 1960 she began a prolific relationship with Vanguard who released her debut proper Joan Baez in 1960. The follow-up Vol. 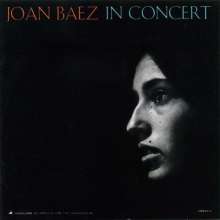 2 (1961) was a Gold record as were Joan Baez in Concert and Joan Baez in Concert, Part 2. So by the time of the British Invasion she was already a household name in authentic folk circles. Having made her name with traditional songs arranged by her and producer Maynard Solomon Baez stunned her followers when she made her first Dylan covers on Joan Baez in Concert, Part 2. - “Don’t Think Twice It’s Alright” and “With God on Our Side” in 1963. Check the Reissue for bonus tracks including more Dylan: “The Death of Emmett Till” and “Tomorrow Is a Long Time”. 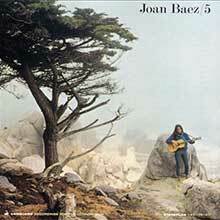 Joan Baez/5 is another great place to start a discovery. Here you’ll find pieces from Villa-Lobos, Dylan’s “It Ain’t Me Babe”, Phil Ochs’ “There But for Fortune” and Johnny Cash’s “I Still Miss Someone”. Despite the minimal sound this album made the Top 20 in 1964 while “Farewell Angelina” was a sensation with the Dylan tracks “Daddy, You Been on My Mind”, “It’s All Over Now, Baby Blue” and “A Hard Rain’s A-Gonna Fall” sitting next to Donovan’s “Colours” and Woody Guthrie’s “Ranger’s Command”. The album simply called Joan is a favorite in these parts since it contains covers of Tim Hardin’s “The Lady Came from Baltimore” and “If You Were a Carpenter”, Richard Farina’s “Children of darkness” and the Lennon/McCartney masterpiece “Eleanor Rigby”. One of the great albums that kinda got away in 1967. Portrait of Joan Baez is a UK released compilation from the same year that was released to coincide with her now regular British tour. Safe to say that by 1968 Joan Baez was a superstar. Her spoken verse disc Baptism: A Journey Through Our Time is one for the connoisseur but Any Day Now is absolutely essential. A double album composed exclusively of Dylan songs this is the first time Baez uses a full rock or country ensemble. One of the first North American stars to relocate to Nashville Baez employed the stellar talents of Grady Martin, Norbert Putnam, Buddy Spicher, Pete Drake, Harold Bradley and Stephen Stills and nailed the Bob songbook right down. She stays in Nashville for David’s Album and the majestic One Day at a Time, the latter including players like Charlie McCoy, Jerry Reed and Pete Drake who put a brilliant sheen on the Stones’ “No Expectations”, Steve Young’s “Seven Bridges Road” and Willie Nelson’s “One Day at a Time”. Another comp, The First Ten Years, would make a handy primer for the first vanguard phase. Baez moves ahead again in 1971 with Carry It On, offering a very early cover of Gram Parsons’ “Hickory Wind”, an adept take on the gospel classic “Oh Happy Day”, Dylan’s “I Shall Be Released” and the rare Bob song “Love Is Just a Four-Letter Word” – a very nice rarity on original single form with the vintage Vanguard logo. Her studio association with the label ends with Blessed Are… a thoroughly modern country folk and rock disc that pours attention over Kris Kristofferson, Mickey Newbury, Jesse Winchester, The Beatles, Stones and The Band. This is well worth discovery. It was popular in 1971 and sounds fantastic forty-five years later! A move to A&M keeps Baez in our fold. Something of a fixture in Nashville now she produced her own Come From the Shadows with her good ole boy A-team. The most significant disc in this era is Diamonds & Rust, a folk jazz extravaganza with top class players like Larry Carlton, Dean Parks, Wilton Felder, Jim Gordon, Joe Sample and Malcolm Cecil. This fine album sent her back to the charts thanks to marvelous takes on songs from Dickie Betts, Dylan’s “Simple Twist of fate”, some John Prine and Jackson Browne and a soul folk marvel – Stevie Wonder and Syreeta Wright’s “Never Dreamed You’d Leave in Summer” from his groundbreaking and radical soul switcheroo Where I’m Coming From. Joan’s own milestones carried on arriving. From Every Stage is a live double recorded on her 1975 concert tour with the crack band of Carlton et al. Her final A&M new material can be heard on Gulf Winds, mostly written while she toured on Rolling Thunder Revue. Following a label change to Portrait there are still several anthologies from A&M and Vanguard to explore. 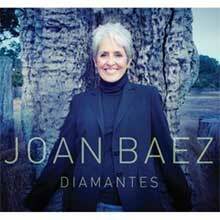 Joan Baez: Classics is worth mentioning, as it’s her first on Compact Disc. A switch to Gold Castle gives us Recently, also Diamonds & Rust in the Bullring) half Spanish/half English renditions. Her move into the 1990s is the ambitious Play Me Backwards, a nod at the newer breed of Nashville players and also emergent songwriters Mary Chapin Carpenter and John Hiatt. For a thorough overview try discovering the box set Live & Classic (this includes two cuts with the Dead) where she duets with Kristofferson and Odetta and other vital guests. If by now you’ve got the Baez bug then go retro for Live at Newport, a carefully assembled set of her performances from 1963-1965. This is real folk rock history. Fine discs for Guardian (Gone from Danger and Dark Chords on a Big Guitar) take Joan into the 2000s. Bowery Songs nods back to her own roots (plenty more Dylan and Guthrie) while the most recent effort is on London-based Proper. Day After Tomorrow is independent in spirit also with producer Steve Earle encouraging vintage performances from the main event as she uncovers songs from Elvis Costello, Tom Waits and Kathleen Brennan, Thea Gilmore and Patty Griffin. Totally recommended for discovery. For good catch up value try Best of Joan Baez: The Millennium Collection and if funds allow then investigate The Complete A&M Recordings. Hoping that all whets your appetite. Joan Baez is to some one of those name s from the past who’s actual worth and work are often misplaced in the memory. Discovery is mandatory if you want to know the true story of how folk music evolved. She is still highly active on the music scene and remains as vital as ever. 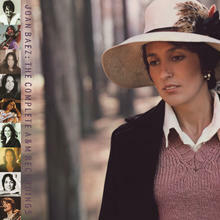 Joan Baez in Concert, Part 1 is a live album taken from Joan Baez's 1962 concert tours. It peaked at #10 on the Billboard Pop Albums chart and includes 'Babe, I'm Gonna Leave You', 'Copper Kettle' and 'The House Carpenter'. With the Vietnam War winding down, Joan Baez, who had devoted one side of her last album to her trip to Hanoi, delivered the kind of commercial album A&M Records must have wanted when it signed her three years earlier. But she did it on her own terms, putting together a session band of contemporary jazz veterans like Larry Carlton, Wilton Felder, and Joe Sample, and mixing a wise selection from the work of current singer-songwriters like Jackson Browne and John Prine with pop covers of Stevie Wonder and the Allman Brothers Band, and an unusually high complement of her own writing. A&M, no doubt recalling the success of her cover of the Band's "The Night They Drove Old Dixie Down," released her version of the Allmans' "Blue Sky" as a single, and it got halfway up the charts. But the real hit was the title track, a self-penned masterpiece on the singer's favorite subject, her relationship with Bob Dylan. Outdoing the current crop of confessional singer/songwriters at soul baring, Baez sang to Dylan, reminiscing about her '60s love affair with him intensely, affectionately, and unsentimentally. It was her finest moment as a songwriter and one of her finest performances, period, and when A&M finally released it on 45, it made the Top 40, propelling the album to gold status. But those who bought the disc for "Diamonds & Rust" also got to hear "Winds of the Old Days," in which Baez forgave Dylan for abandoning the protest movement, as well as the jazzy "Children and All That Jazz," a delightful song about motherhood, and the wordless vocals of "Dida," a duet with Joni Mitchell accompanied by Mitchell's backup band, Tom Scott and the L.A. Express. The cover songs were typically accomplished, making this the strongest album of Baez's post-folk career. A month-and-a-half after the release of her first studio recording in six years, and perhaps her finest recording since 1975's Diamonds & Rust, Joan Baez's complete A&M recordings offer a revelatory view of the artist at her most adventurous. Baez's tenure with A&M lasted from 1972-1976 and yielded five studio albums, a live recording, and three non-album singles. All of them are included here on four CDs with gorgeously remastered sound, a deluxe package with exhaustive, insightful, and unflinching liner notes by Arthur Levy, and a package that should win a Grammy for design and presentation if nothing else.Baez, regarded in the popular culture at large as a "folk" or "topical" singer (the latter term she would not refute, the former hasn't fit her for some time), has always been a restless artist. This box set offers proof that Baez's switch to A&M -- then an independent, now swallowed whole by Universal -- from Vanguard, facilitated a virtual renaissance for her not just creatively, but on the charts as well. This reappraisal is necessary, given Baez's most recent recordings have reflected another shift in her sound and concerns, away from being a songwriter to being an interpreter of fine, edgy, roots songs by a whole slew of younger writers -- and her seeming embrace of the electric guitar. The earliest evidence of Baez's rambling vision can be heard on her experimental album Baptism, from 1968. Upon moving to A&M, and recording from her Nashville studio base, Baez released her self-produced Come From The Shadows (with help from Norbert Putnam), featuring -- like her latter day Vanguard recordings -- a host of Nashville's finest musicians, which included David Paul Briggs, Pete Drake, Kenneth A. Buttrey, Charlie McCoy, and Grady Martin. It was certainly a political record, but it also included the stunning "Love Song To A Stranger," and her sister Mimi Fariña's "In The Quiet Morning," written in memory of Janis Joplin.The other half of Disc One is comprised of Where Are You Now, My Son from 1973, co-produced by Baez and Henry Lewy. It included a slew of originals by Baez, including the title track, a pair of songs by Fariña, and Hoyt Axton's "Less Than A Song." Most importantly, it was a move toward something outside of the country-rock realm she'd been toying with. That "something" first occurs on Disc Two with her traditional album of Latin folk and topical songs from Gracias a la Vida, and, of course, 1975's Diamonds and Rust with David Kershenbaum helping her out in the production room. The latter album, heard so many years after the fact of its inception and release, has Baez experimenting with soul -- Stevie Wonder's "Never Dreamed You'd Leave in Summer"; hard country: Dickey Betts' "Blue Sky,"; and moving around toward Dylan once again, as she was part of the Rolling Thunder Review, with a stellar version of "Simple Twist Of Fate," as well as the legendary title track. Along with it, Baez wrote four songs, and recorded others by John Prine, and Jackson Browne, and offered a deeply moving rendition of Stephen Foster's "I Dream of Jeannie" melded with "Danny Boy." It was the masterpiece that both critics and fans knew she was capable of delivering and had been leading up to since Blessed Are.., her final album for Vanguard. It, along with most everything here, has aged well and endures. Disc Three features the second half of Diamonds and Rust, and another fine, if criminally under-appreciated, album Gulf Winds, released in October of 1976 and comprised entirely of Baez originals.Disc Four features one of the best live recordings from the 1970s, From Every Stage, compiled from a handful of shows and not enhanced in any way. Some of the members of her road band included no less than one of Motown's Funk Brothers in bassist James Jamerson, drummer Jim Gordon, pianist David Briggs, and guitarist Larry Carlton. Moving across the space of her entire career, it is a moving, engaging, and utterly transcendent recording, offered in an era when live records sucked -- they were no longer live but edited heavily in the studio. This box features each album's original liner notes, as well as a host of stunning photographs. But besides the elegant package, the music tells the story of an artist who pushed herself beyond the laurels of her living legend, who worked at trying to find, in the swirling winds of change, a complexity outside her accepted norm, and finally, a relevant, constantly evolving place for herself as an artist. The evidence is in: she succeeded in spades. 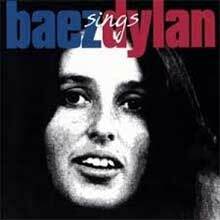 Culling 15 tracks from her 1968 release of Any Day Now and adding five tracks taken from her releases of the early '60s, Vanguard Sessions: Baez Sings Dylan is a wonderful example of Joan Baez's ability to transcend the work of other songwriters. Though it could be said that the genius of Dylan's songcraft can occasionally be obscured by the understated starkness of his presentation, Baez's use of slightly countrified arrangements to compliment her powerful vocals succeeds in recasting these classics in a slightly prettier package. Baez takes few liberties, so most tracks don't count as surprises, though a bluesy a cappella rendition of "Tears of Rage" and a funky, soulful "Dear Landlord" nearly qualify as such. More than anything, Baez's renditions make the listener realize just how incredibly nuanced Dylan's delivery can be. Though standards like "You Ain't Goin' Nowhere," "It Ain't Me Babe," and "I Shall Be Released" are covered, just as many tracks are of a lesser-known variety, such as "Walkin' Down the Line," "Love Is Just a Four-Letter Word," and "Walls of Red Wing." Of course, bringing out the genius in Dylan's work isn't exactly akin to pulling teeth, but the timeless quality of Baez's thoughtful renditions more than does the work justice. 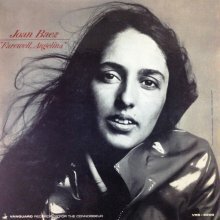 One of the oft-overlooked aspects of Joan Baez's career in the 1960s is that after the first four albums, she never did the same thing twice; what's more, with the possible exception of the Baptism album, she succeeded at least 90 percent of the time in practically everything new that she tried during that decade. One Day at a Time is much closer to 100 percent on target, and was also startlingly new and daring at the time. Today it seems like no big deal, but in 1970 very few singers coming out of the folk scene as Baez did were reaching out to Willie Nelson ("One Day at a Time") and even the Rolling Stones ("No Expectations") for repertory, much less putting them on the same album with music by old leftist composers like Earl Robinson ("Joe Hill"), and then interspersing those songs with traditional country numbers. Even better, she was also writing her own songs, one of which, "Sweet Sir Galahad," ranks among the best songs that she ever recorded (no small compliment considering that the latter list includes much of the Dylan catalog, among other heavyweight compositional competition). She was in the middle of her country phase, mostly working with the best players in Nashville (who are a pleasure to hear as well), but One Day at a TIme has a freer, looser feel than David's Album or Blessed Are, both of which came out of the same orbit. Her version of "Long Black Veil" could've passed muster at The Grand Ol' Opry, and she could've cut these sessions with Dolly Parton, June Carter Cash, or any other female country singer of the era and not been out of place. The sheer, understated power of her voice on Delaney & Bonnie's "Ghetto" and on "Carry It On" is also something to behold, and makes one wonder what kind of a gospel singer Baez might have made in another reality. Yet she could also loosen up enough to do a pure piece of sentimental traditional country music like "Take Me Back to the Sweet Sunny South" and make it work, too. And amid those multi-tiered, widely spaced superlatives, One Day at a Time also had (and still has) an additional facet that should make it essential listening on another level, to yet another audience -- it's an excellent companion to and extension of Baez's appearance on the Woodstock album, as three of the cuts here feature her working with Jeffrey Shurtleff, who was her accompanist at the festival as well. Joan Baez 5 was where the singer's music experienced its first major blossoming. Having exhausted most of the best traditional songs in her repertory on her four prior LPs, Baez had to broaden the range of her music, and she opened up some promising new territory in the process. Baez and Vanguard Records must also have recognized by 1964 that the folk audience was changing and, in fact, was no longer just the "folk" audience -- they were expecting current compositions in a folk vein, especially topical material, and also a certain degree of eclecticism, and Joan Baez 5 runs the gamut from classical to country. The album opens with a rendition of Phil Ochs' "There but for Fortune" that was so alluring that Vanguard released it as a single, and it actually saw some modest chart action; Baez nearly pulled off a Peter, Paul & Mary, masking the song's piercing, topical lyrics (which addressed more hot-button issues in three minutes than most radio stations preferred to acknowledge in a week's worth of editorials) in a falsetto so lovely that they simply eased past most of the censors, right-wingers, and anyone else who might've objected. Her recording of Dylan's "It Ain't Me Babe" was the latest in a small but growing list of her excellent covers of his songs, culminating with the release of the two-LP Any Day Now later in the 1960s. Even the Dylan cover pales, however, next to her rendition of Richard Farina's "Birmingham Sunday," a recollection of the school bombing that's still a raw nerve in the state of Alabama, four decades later -- her performance is as beautiful as the song itself is quietly dark and ominous. She still found room for material drawn from traditional English folk songs and settings by Richard Dyer-Bennett and John Jacob Niles, and Baez's version of "Stewball" was perhaps the prettiest of a brace of covers of the song (there was even one by the Hollies) from around this period; her performance of "When You Hear Them Cuckoos Hollerin'," accompanied by Gino Foreman on guitar, was one of the most haunting recordings in her output. Her attempt at Heitor Villa-Lobos' "Bachianas Brasileiras No. 5 -- Aria," accompanied by an ensemble of eight cellos led by Utah Symphony Orchestra conductor Maurice Abravanel (who was also on Vanguard), was a valiant effort that doesn't really come off. Equally unexpected but far more successful is her version of Johnny Cash's "I Still Miss Someone," which was probably the prettiest cover any of the country giant's songs had been treated to up to that time (and if Baez's version was noticed by too many people in Nashville, it only bore out the suspicions in some circles that Cash was part of a commie conspiracy). It was Baez's first brush up against country music, which would prove a rich and vital vein for her in the decades to come. It's sign of just how seriously and important Baez's music was considered at that time that the album contained an essay in tribute to Baez by no less a figure than Langston Hughes -- it's a sign of the difference in our times that it's difficult (indeed, well nigh impossible) to imagine a recording by a white artist in 2002 that would command that kind of attention from a black literary figure, or a record company that would make use of such as essay if it were offered. Listening to this album a quarter century after the fact is an eerie experience; as a Baez fan of the same period and of a politically similar orientation at the time, this reviewer was shocked by the vitriol of the opening number, "(Ain't Gonna Let Nobody) Turn Me Around," especially given that the shows where this album was recorded dated from 1975. Was anyone (except maybe the Reagan-ites) ever really that angry at the Ford administration? Otherwise, Baez's trembling falsetto is in beautiful shape on songs ranging from Leonard Cohen's "Suzanne" to "Oh, Happy Day." 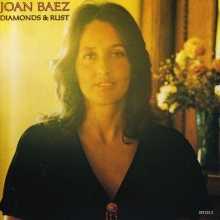 The album was recorded on the tour supporting the release of Diamonds & Rust, but nothing of that album except the title track is represented here; rather, Baez performs five Bob Dylan songs (which get the most rousing reception), three of her better originals, including "Blessed Are" and "Diamonds and Rust," and a brace of traditional songs and covers of a handful of other composers' work, including "The Night They Drove Old Dixie Down." Apart from the opening outpouring of political venom, there's not too much controversy here -- a pair of songs, "Natalia" and "The Ballad of Sacco and Vanzett," dedicated to political prisoners and an ambitious but ultimately awkward adaptation of "Stewball" are as topical as most of the show gets. Baez is in superb voice and the backing septet, mostly heard on the second disc, has a surprisingly lean sound. 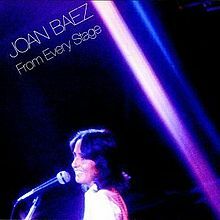 Ultimately, From Every Stage is a good, albeit far slicker follow-up to Baez's two early-'60s live albums on Vanguard, though it says something about the nature of her history at A&M Records that five years into her contract with that label, all but a handful of the songs here were associated with her prior record label. At the time of its release, Joan Baez's debut album was something of a revelation. The folk music revival was beginning to gather steam, stoked on the popular side by artists such as the Kingston Trio and the Easy Riders, as well as up-and-coming ensembles such as the Highwaymen, and on the more intense and serious side by the Weavers. The female singers on the scene were mostly old-time veteran activist types like Ronnie Gilbert and Malvina Reynolds, who was in her sixties. And then along comes this album, by a 19-year-old who looked more like the kind of co-ed every mother dreamt her son would come home with, displaying a voice from heaven, a soprano so pure and beguiling that the mere act of listening to her -- forget what she was singing -- was a pleasure. Baez's first album, made up primarily of traditional songs (including a startling version of "House of the Rising Sun"), was beguiling enough to woo even conservative-leaning listeners. Accompanied by the Weavers' Fred Hellerman and a pair of session singers, Baez gives a fine account of the most reserved and least confrontational aspects of the folk revival, presenting a brace of traditional songs (most notably "East Virginia" and "Mary Hamilton") with an urgency and sincerity that makes the listener feel as though they were being sung for the first time, and opening with a song that was to become her signature piece for many years, "Silver Dagger." The recording was notable for its purity of sound. By late 1965, most members of the folk community were feeling the pressure of a changing music world -- between presence of folk-rock bands like the Byrds and newer outfits like the Beau Brummels and the Leaves coming up, not to mention Bob Dylan himself going electric, they were now competing against some high-wattage (in the most literal sense) rivals for the attention of audiences. Most wilted in that environment, but Baez rose to the occasion, partly because she was able to -- her voice was one of the most hauntingly beautiful in the world, and she was no slouch when it came to finding (and later writing) good songs. To be sure, her sixth album is top-heavy with Bob Dylan songs, including the title track, which he never officially recorded -- on that basis alone, it attracted a lot of attention from his fans -- and her epic rendition of "A Hard Rain's a-Gonna Fall," which can stand up next to Dylan's own for sheer, sustained power, and her falsetto-driven performance of "It's All Over Now, Baby Blue" didn't hurt in that department. But rather than relying on the Dylan repertory to sell the album, she made Farewell, Angelina worthwhile all the way through. Of the two traditional songs here, "The River in the Pines" is a throwback to Baez's simple, unadorned early sound; but "Wild Mountain Thyme" is something new and special, her understated yet jaunty-tempo rendition almost minimalist in its scoring, yet it sticks with the listener as long (or longer) than, say, the Byrds' recording. Her version of Woody Guthrie's "Ranger's Command" should be heard for its sheer lyricism and loveliness, and her recording of Donovan's "Colours" might even have been a hit single if it had been handled right -- Bruce Langhorne's amplifier turned up one notch, from 3 to 4, might've done it. "A Satisfied Mind" was not only a stunning recording (especially on the final verse), but took her one step closer to the country music sound and repertory that would enrich Baez's music in the second half of the '60s. And she even managed to give a special nod to Pete Seeger's universal notions of pacifism by including a German version of "Where Have All the Flowers Gone." Beyond Baez's singing, the album is also worth hearing for Langhorne's guitar work and the performance of Richard Romoff on string bass on "Wild Mountain Thyme" and "A Hard Rain's a-Gonna Fall." This would be the last time that Baez would work with so small, spare, or deceptively simple an accompaniment -- the next time out, she'd have a full orchestra and then a complement of Nashville musicians backing her. 'Diamantes' was originally created for a tour of South America in 2014. It combines Spanish language songs culled from the 1988 recording, 'Diamonds and Rust in the Bullring,' with some concert favourites and two newly recorded Portuguese songs, "O'Cangaceiro" and "Ate Amanha/Te Ador". Six of the tracks - "God Is God" (penned by Steve Earle), "It's All Over Now Baby Blue" (Bob Dylan)" Imagine" (John Lennon), "Farewell, Angelina" (Bob Dylan), "Swing Low, Sweet Chariot" (which famously Baez sang at Woodstock) and "The Boxer" (Simon & Garfunkel) are recent concert recordings, previously unreleased.